100% all-natural Native American high quality tobacco is what makes up Ten Pointer Pipe Tobacco. Produced on the Akwesasne Mohawk Indian Reservation by Ohserase Manufacturing, this premium tobacco is cured carefully and blended together allowing for an easy slow burn that gives a full-bodied flavor with an elegant natural sweet aroma. “Smooth by Nature” is how Ten Pointer Pipe Tobacco has been described. 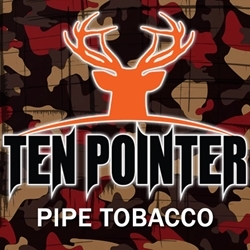 Ten Pointer Pipe Tobacco is distributed nationwide by Ohserase Manufacturing, LLC Akwesasne, NY located on the Akwesasne Mohawk Indian Reservation. Each pouch of Ten Pointer Pipe Tobacco are available at our online tobacco store in 3 unique styles to choose from. Full Flavor, Light, and Menthol. Our online premium tobacco store offers great deals and inexpensive ways to save money on over-prices retail brands. Ten Pointer Pipe Tobacco can be the right choice for your money saving needs. Here at Smokers Discounts we’ve made it easy and affordable to buy pipe tobacco online. Call us for more details!